Beneath the placid surface of the internet, a cyber war is raging. Who guards the web and how do they keep us safe? Like clean water flowing from a faucet, the internet is always there. Most of us rarely question how these miracles reach us or what’s going on behind the scenes. As long as we can check out what Esther the Wonder Pig is up to on Instagram, we don’t consider how easily our access might run dry. But the internet is under constant attack. Behind our screens and devices, a constant stream of malicious cyber activity washes through the high-speed networks that keep us connected. Cyber attacks threaten everyone from private users, to the financial sector, educational institutions, industry, and government. Malware, phishing, and DDoS attacks currently top the list of the most common methods of disruption. Though the motivations behind attacks vary, from profit-motivated crime to hacktivism, cyber espionage and warfare, no spot on the globe is unaffected. But like the scientists and engineers who keep our streams clear and our drinking water safe, computer network experts work to keep the internet free of pollution and gushing at full capacity. The first step is to reveal what happens under the surface. 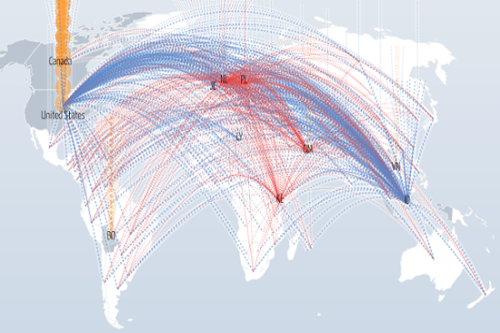 Several online maps visualize the saturating volume of malicious web activity taking place all over the globe at any given moment. At the time of writing this article, Kaspersky Labs’ Cyberthreat Real-Time Map detects an average of 200 attacks per second worldwide. In addition to reflecting the timing and types of attacks, these attack maps reveal which countries suffer the highest number of attacks and from which countries the most attacks originate at any given time. The US, Russia, and India are regular contenders on both lists. Internet users in the US and Europe may remember the multiple DDoS attacks in October 2016 that disrupted internet traffic on both sides of the Atlantic, taking popular sites like Twitter, Netflix, PayPal, and CNN offline. Hackers use botnets (networks of infected computers) to overwhelm websites with so much concentrated traffic that legitimate visitors are unable to reach the desired site. In addition to frustrating customers, a DDoS attack on a major website can mean a loss of as much as $20,0000 - $100,000 per hour of outage. DDoS is such a popular strategy for clogging the pipes that an attack against a website of your choice can easily be purchased online for as little as $150, with extra fees charged for bombarding targets that deploy more robust security (such as government sites). 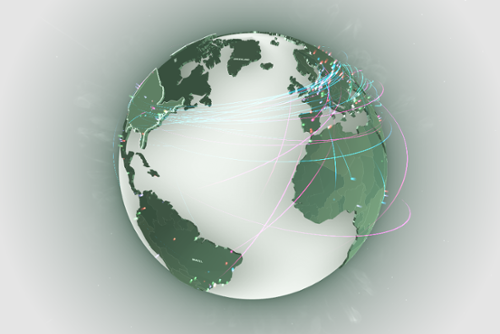 The Digital Attack Map is a live visualization of DDoS attacks around the globe. 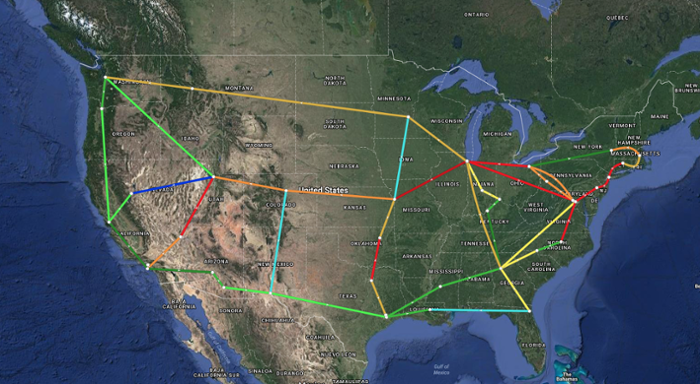 Built through a collaboration between Google Ideas and Arbor Networks, it gathers its data from more than 270 ISP customers who have agreed to share anonymous traffic and attack statistics and can be used to compare DDoS activity historically over time. Researchers at Saarland University in Germany have studied and documented as many as 1.5 million DDoS attacks and have announced recently that they have developed a method for predicting attacks before they happen, and preventing them — or at least limiting the damage. Scientists rely on specialized, high-performance research and education networks to transfer large datasets and enable large-scale national and international scientific collaboration. US climate scientists, for example, employ the world’s fastest supercomputers to run computationally intensive climate models for weather forecasts and climate change predictions — and they must transfer over 80 terabytes of data a day from remote computers to labs in other parts of the country. Though these networks serve researchers and educators, they, too are subject to hacking and other disruptions. To monitor the health of these research networks, engineers like those at the Global Research Network Operations Center (GlobalNOC) at Indiana University use real-time maps to monitor network traffic. 24 hours a day, 365 days a year, GlobalNOC stands guard over a web of national, international, and regional networks that serve the research and education community, including state governments and K-12 schools. Like the hydrologists that safeguard our water supply, a community of computer security experts strive behind the scenes to keep the river of scientific research clean, cool, and ready to drink.